“However, learning empathy takes effort, and empathy alone does not guarantee positive connections. It is a tool or skill that provides people with information from which we are then free to take actions, or not. Empathy itself is neutral. What we choose to do with it is up to us”. The thing is, the wisdom applies to all areas of our and humanity’s lives. When we refuse, because of our beliefs experience, apathy, or our ostrich head-in-the-sand approach, to make the changes we need individually and collectively, the same problems and patterns keep repeating themselves and people keep paying the costs of preventable tragedies. It may sound too absurd to think that a little shift in our thinking can address the complex problems of our world … but I speak from experience and know it can and it does. And I’m not talking about love or religion, but about an intellectual secular idea that does include a little heart in it. I know the feeling very well, yet I also know the success will come … in time. Until then, well, the answer is finding the best work to use my natural talents, characteristics, experience, and drive so I will enjoy the employment until I am fully supported by my for-profit social business venture transforming respect from a discretionary value to the global principle … by writing books and creating products to raise the standard of living and quality of life of all people. Who knows, maybe you are the employer who needs what I can provide? Regardless, I cannot express how empowering it is to discover who you really are in order to step up and start cutting your own unique path. 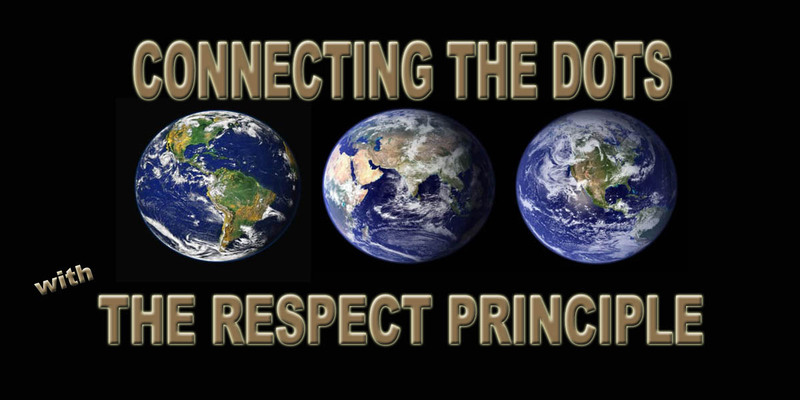 Condolences to all, plus the hope more people will finally grasp the need to adopt a global philosophy/principle that all life is valuable … to be respected … because without it, well, the past and present tell the truth and show the consequences of disrespect as the dominant belief. Connecting the dots the big picture reveals the greatest benefit to all of humanity is to plant the trillions of trees businesses have been clearing for centuries. Giving back the natural resources they’ve used on the land, they’ve used with the profits they’ve gained is not only good for the earth, it’s good for them too … because trees generate and provide oxygen for all of us and they take up the carbon dioxide we generate, which makes for healthier people, yes, that means workers too, which means less lost employee time, less injuries due to brain fog, less health care costs etc. etc. etc. As for Notre Dame Cathedral, yes it is a historic landmark, a Catholic landmark and since the Vatican has a great deal of wealth, well, shouldn’t the Catholic church and France be the groups to rebuild their church and landmark, while we work on rebuilding the earth? Dominating the American population and likely many others, Myers-Briggs Type Indicator “Extroverted” Personality Types are a talkative bunch. They talk to process their thoughts, talk to communicate, talk for stimulation, congregate to get energized, and sometimes they listen also. They like group activities, the more the merrier as it ramps up their brain activity. It’s how they function best. Not so much for Introverts. On the contrary, the other part of the population are the Myers-Briggs Type Indicator “Introverted” Personality Types, of which I am one, can get burnt out spending too much time with “Extroverts” simply because the external stimulation combined with their own high internal stimulation is overwhelming, while an “Extrovert” spending too much time with “Introverts” can become lethargic, etc. from the lack of external stimulation. Some people erroneously think introvert means shy, but like many “Introverts,” I’m not shy, in fact I am quite bold, though it may have appeared that way when I had been conditioned to believe I wasn’t up to par with all the “Extroverts” in my life. What none of us knew at the time is that I just needed quiet time, especially alone time, not because I was being snobbish or thinking myself better than others, but simply because inside my mind is a very active place driven by an internal versus external drive, so quiet surroundings stop me from becoming overloaded with stimulation. Quiet time alone is also where my best problem-solving and creative processing functions best. As of result of an “Extrovert’s” and an “Introvert’s” natural brain-processing differences, a lot of misunderstanding, confusion, fear, and even prejudice can be generated because some people are so very different from what is familiar to us. Today is Good Friday, which for Christians means, recognizing the day when Jesus Christ was persecuted and killed for His differences born of people’s fears, ignorance, and resulting prejudice. Jesus was an enigma … the most mysterious human of all and contradictory to what was deemed acceptable. Therefore the fearful majority demanded His death and the leader of the time, for political reasons, knew he had no choice but to follow their demand, so Jesus was not only killed, but was also made a symbolic spectacle of what would happen to those different from the majority. If an “Introvert” is successful, the mystery surrounding him or her is captivating. Take for instance Keanu Reeves. The attached link takes us to a GQ interview of Keanu, where the interviewer seeks to get the answers many seek about this enigmatic man. But the thing is, as a high-level “Introvert” I get Keanu even though I do not know him personally nor all the details of his life because I don’t have to in order to know how he works. What I do know is that what people see in photos and on film is what he chooses to reveal for his profession, similar to the ice of an iceberg one sees above the surface, in contrast to the bulk of his essence that lies below the surface. It is the same for me, but since I am not successful yet, I am not so intriguingly mysterious as I am harshly and incorrectly judged even though I have been working on a body of work that will help raise the standard of living and quality of life of all people. I tried to straddle both worlds, working in the “Extroverts” world, but then I had nothing left energy wise for the “Introverted” world of analysis, problem-solving, and creation of a body of work to help every child, every person, experience being valued … respected simply for being a life … because the world we have created was and is tearing my heart and soul apart with every account of disrespect … neglect, abuse, and violence. Enigma. Yes, we all enjoy a little bit of mystery in life, but let us not let fear and the resulting prejudice take hold where respect, compassion, and even love need to be to co-create the better world we all want to live in.